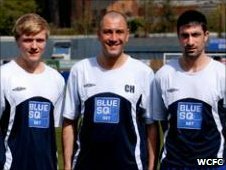 Worcester City's central midfield duo Tom Thorley and Kevin O'Connor have signed new one-year deals with the Blue Square Bet North club. Thorley, 21, and O'Connor, 25, both joined City at the start of the season and have since played together in the heart of midfield in almost every game. The new deals keep them at St George's Lane until the end of next season. "They're key signings and it gives us a core of a side to build round," manager Carl Heeley told the Worcester News.